The Spinner NXT is a commercial grade bike for gym and home use. It is one of the most popular spin bikes in gyms. But what works in a gym may not be the best for the home. In our review we look at whether this obviously well thought of bike has what is needed to make it right for use in your home as well as the gym. a great cardio workout from it. This is a great start for a bike you want to use at home or in a gym for that matter. The bike itself is basic without any frills other than a double water bottle holder. Spin bikes are designed to be used for intense workouts so the luxuries you see on other exercise bikes are missing. It does mean you can concentrate on your workout at home without going to gym or training out on the road in the cold and/or wet weather. This bike is made of heavy duty steel and comes with a heavy 41 lbs flywheel. The overall weight of the bike is 140 lbs. Once set up and everything is tightened up properly it doesn’t move about and you feel safe as you workout. There is no shaking or side to side movement when you are really pushing hard or jumping in and out of the seat. You can just concentrate on pushing yourself as hard as you want during your workout. The flywheel weight gives you a fluid riding motion when you are getting started and also when you apply resistance. There is no feeling that you are riding the bike in the wrong gear nor is there and jerkiness as you go through the pedaling cycle. You can use this bike on an uneven surface as the feet on the stabilizer bars can be adjusted to prevent any rocking when you are spinning or training. The maintenance required to keep the bike in good shape is detailed in the manual that comes with the bike. It includes wiping down, inspecting for any loose assemblies and tightening, from time to it will be necessary to adjust the chain tension and replace the resistance pads as required. 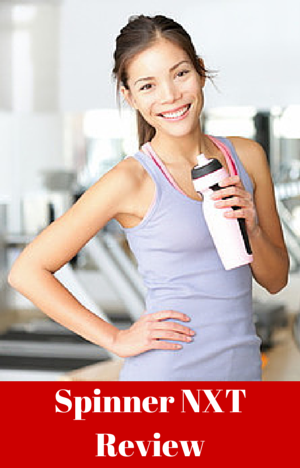 It doesn’t take too much time and most of it is usual for any type of cardio exercise equipment. The pads are available from the manufacturer. This all helps to keep it in tip top shape for many years of use. The seat and handlebars can be adjusted both vertically and horizontally which makes it possible to adjust the bike to fit your body shape completely for the most effective workout and prevent being cramped or overstretching. The vertical adjustments are done by loosening and pulling the pop pin knobs on the adjustment tubes and sliding the poles to the nearest hole for your size. Once you’ve got them in the right position you tighten up knobs to keep them in place. The horizontal adjustments of the handlebar and seat are continuous and you can position it to where you want within the range – you are not restricted to the pre-set holes. The bike accommodates people between the heights of 4 ft 10 ins and 6 ft 10 ins so it should be right for most people to get this bike to fit them properly. The adjustments are quick and simple to do with markings on the poles so you know where to adjust the bike to for each user. More than one person can use it as the adjustments only take minutes at the most and with the markings you can adjust it to where you want it each time. Different levels of intensity for hill climbs and harder workouts is provided by turning the resistance and brake knob below the handlebars – clockwise for hard and counter-clockwise for easing off. The knob controls a pad that sits on the top of the flywheel that grips the wheel tighter as you increase the tension using friction to make the pedaling harder. The resistance applied is consistent so there is no jumpiness or concern that it will loosen off quickly as you cycle. As well as being consistent with the pressure it is also consistent with how far you have to turn it to get to a certain amount of resistance each time you adjust. However, there are no markings on the bike to know where you have turned the knob to. This can make it difficult to return to previous level of resistance particularly if someone else has used the bike in the meantime and adjusted the resistance. The pad will wear down over time and need replacing. Depending on usage they normally need replacing every 12 months. The bike comes with a spare resistance pad and when you need more you can order from Spinner. How to replace is covered in the manual, it is straightforward and doesn’t require specialist tools or knowledge. The bike has a chain drive to turn the flywheel as you get on an outdoors bike. It is housed within a guard to protect it from sweat and also this keeps you from getting your ankle or clothes caught in the chain. It makes a little noise like you get on an outdoor bike but it isn’t that loud. As with an outdoors bike there is some maintenance required in keeping it lubricated and properly tensioned (all described in the manual). It isn’t too much. The advantage of a chain drives have over belt drives is that you get a ride more similar to a road bike but the chain drive is a little louder, requires more maintenance. the other benefit is that spin bikes with chain drives usually costs less. The pedals are dual with toe cages on one side and SPD fittings on the other. It saves on having to buy pedals if you want to use your specialist shoes and if you haven’t the toe cages fit most shoe sizes and can be tightened using the adjustable straps. The bike comes with spare straps in the spare parts kit. If you don’t like the pedals you can change them over for pedals more to your liking as the bike fits standard pedals. The Spinner NXT has a fixed gear so there is no freewheeling, when the flywheel is turning the pedals are turning so your legs are moving too, to help in getting more physical activity. You can stop the wheel quickly by pushing down hard on the resistance knob to use it as brake or slowly use your feet on the pedals to slowly stop it. You do need to be careful you aren’t too aggressive with this way of stopping the pedals and flywheel as this can result in injury. The q factor for the bike is 158 mm which is good for spin bikes. This is the horizontal distance between the inside of the left and right pedals. The narrower the distance between them, as a general rule, the more natural the ride feels and the less chance of injury especially if you plan on using the bike a lot and for long periods of time. Noise. There is some noise from the bike. This comes from the chain drive and the resistance pad. It is a low level noise with the chain clinking over the sprockets and the resistance pad making a quiet shushing sound as it applies pressure to the wheel. You can easily hold a conversation while riding the bike and watch TV and your Spinner(R) DVDs. You should also be able to use it while others are asleep without disturbing them. If you think noise is going to be an issue because of light sleepers or you live in an apartment you can consider bikes that have magnetic resistance and belt drive. These are quieter bikes. For instance, the Keiser M3 Plus is a top rated bike that is also used in many clubs across the country. It costs more but comes with a magnetic resistance, belt drive, console and marked resistance levels. The assembly is a little more difficult than standard for home spin bikes.It is one of the most highly rated indoor cycles and spin bikes available. Dust and Dirt. As with any exercise equipment the bike is going to drop lubricant from time to time and dust will be given off as the resistance pad wears down. Also it is likely you will drop sweat on to the bike and onto the floor. It is important to clean and maintain the bike as instructed to keep it in good working order. Also the floor may get damaged but this can be protected by placing the bike on an rubber exercise mat. Riding Position. It is designed to be used like an outdoors bike so the riding position is similar but you can change the position to find the most comfortable and efficient set up for you. You are going to be leaning forward on to the handlebars so if you have any issues with your back you may need to consider other exercise bike types for your workouts. Seat. The seat is a standard size bike. It seems most people are okay with this seat but you may find it uncomfortable. If you do you can try bike shorts with padding or gel seat cover and if you want you can change it for any other standard size bike seat. Handlebars. The handlebars are covered with a rubberized grip to help in preventing blisters and prevent slipping when your hands get wet from sweat. If you want to lean on them with your arms rather than gripping with your hands you may need elbow pads as they aren’t padded. They are designed for the standard grips of spinning – in the center when warming up, shoulder width apart when you need more leverage and at the end of the bars for when oyu are standing out of the saddle for the hill climbs. There are 2 transport wheel on the front stabilizer bar that can be used to move the bike to where you want to store it when not in use. It needs an area of 21 by 54 inches. You tip the bike forward on to the wheels from the back. They support most of the weight of the bike so it becomes easier to move it around. The wheels should work on most surfaces but it will be easier on harder surfaces. On wooden floors it is worth checking that using the wheels doesn’t scratch or dent the floor. The bike comes partly assembled and doesn’t leave you with too much to do. The tools required to complete the assembly are included. The frame and flywheel are already assembled. You just need to put on the pedals, stabilizer bars, adjustment poles, seat, water bottle holder and handlebars. The process is explained fully in the manual with pictures and diagrams as needed. There is no need of specialist knowledge to complete. As mentioned earlier the bike is heavy weighing in at 140 lbs which can make it difficult for one person to hold and move while trying to align the holes and bolt together. For this reason you may find it easier to have two people assist in the assembly. Other than that it straightforward as everything lines up and fit as it should. The bike does not come with a console which is standard and those that do at this price range are basic giving you distance, calories burned, speed and time elapsed. It is possible to buy a computer that is designed for this bike separately. It is listed on Amazon at over $150. It shows distance covered and calories burned at end of workout. During the workout is shows cadence (RPM), time elapsed and if you have an ANT+ compatible heart rate strap from Garmin or Polar Coded it allows you to monitor your heart rate. From reviews it seems you need to make sure you don’t drop sweat on it. It doesn’t upload to your computer or to the internet so if you want to keep records for training purpose you need capture the data manually. Monitoring your heart rate is important when training whether it is spinning or indoor cycling to get the most benefit out of it. The Keiser M3 Plus also has a console that you can monitor your heart rate using a heart rate strap, it still works out more expensive even with the add-on of the monitor but it does have a belt drive and magnetic resistance. As mentioned above it is a highly rated gym quality bike. Alternatively you could add a bike computer from Cateye to it, this works out cheaper but you do need to do some alterations to the spoke magnet and attach the sensor to the spoke of the bike , but people have done it for other models of spin bikes to get the feedback they want to monitor performance and help with motivation to keep on pushing themselves on. The bike comes with a dual water bottle holder that sits at the front of handlebars. The water bottles stay in there by gravity making it easy to grab them to get a drink and put them back when you’ve finished. The positioning at the front keeps them out of the sweat zone too so you won’t be grabbing a wet bottle when you need that drink to stay hydrated. There is no where to put your MP3 player or place a book but this is normal for spin bikes with the focus being on intense training rather than moderate exercise. You could place your MP3 player in one of the water bottle holders as other people have done on other bikes but you may want to use an elastic band to keep it in place. Reviews of the bike by actual customers are positive, of the few that have left one. They do state they like the gym quality of the bike and enjoy working out on the bike at home saving on the gym fees and being able to train whatever the weather. It is one of the more expensive bikes available for consumer use but you are getting a bike that is used at clubs extensively so it has been tested. You are paying for the this tested longevity and quality. So there is the expectation that it is going to last a long time and stand up to as many workouts that you and family can do week in week out. The best discounted price I found was on Amazon when I checked. It qualified for free shipping too. This bike can be used by beginners and by more experienced spinners and cyclists. The price may put off beginners but the bike is going to last a long time so if you are dedicated to using the bike frequently it can turn out to be good deal with saving on gym fees and not having to replace it as you grow and want more demanding frequent workouts. It gives you what you would expect from a quality spin bike – a good stable and durable base for intense workouts. It does this to a high standard so you and your family can get many years of use out of it. It doesn’t take up that much room and can be moved out of the way when not in use. The only real negative is that it doesn’t come with a console for feedback and monitoring performance. Other than that you are going to get a spin bike that you can use anytime you want and get great cardio workouts for getting into shape, staying in shape or for training for some event. What supplies are needed to clean/maintain the bike? I”m a LIfestyle Coordinator for Active Wellness in Austin, TX and am also a Spin Instructor. I would like to clean our bikes but want to know exactly what to get in order to do so, thanks! To maintain the chain it is recommended to use a silicon based lubricant. To clean the bike use an absorbent cloth to wipe off any sweat. The manual does cover this in detail and is available online if you search for the bike + manual. 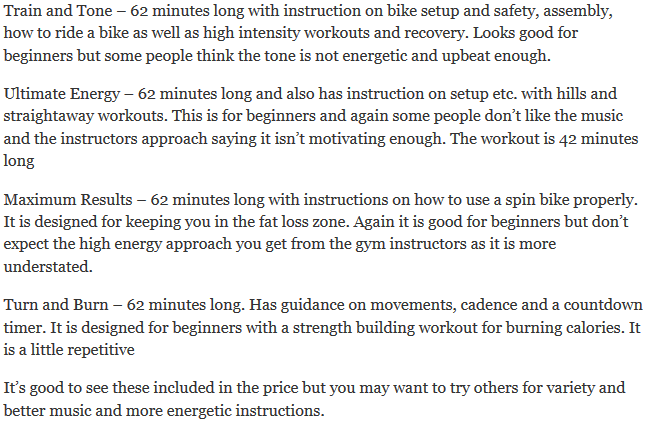 would some body be able to let me know the following about the gym NXT Spinner Bike. 1) what is the circumference of the wheel, or diameter, Radius etc. 2) how many crank peddle turns does it take to rotate the wheel. I am trying to work out how far 100 rotations of the crank is in Miles or Klm. Sorry, I don’t have the wheel information to hand.